One of our favorite cult beauty brands has to be Glossier. This Balm Dotcom trio is the perfect gift for the girl who’s always reaching for a moisturizing lip balm. Plus they smell and look amazing! 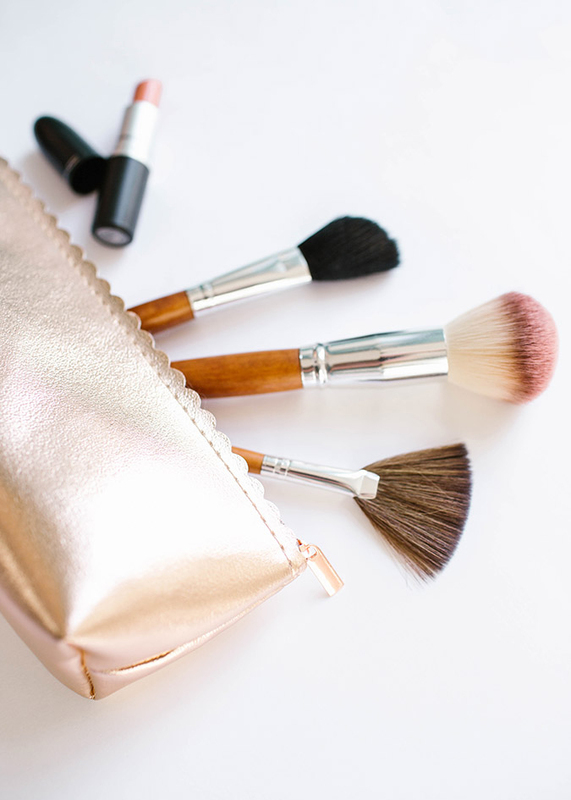 Every beauty babe needs a trusty cosmetic case. Our favorite is definitely this rose gold scalloped option from Lauren’s LC Lauren Conrad collection. If it’s made of marble, we’re guaranteed to love it. This Anthropologie vanity organizer is no exception. Talk about a chic and functional way to keep your sink nice and organized! These floral-inspired hues are mani/pedi worthy if you ask us. If you have a gal in your life that nails the at-home mani, this is the gift that keeps on giving. Give the gift of relaxation this holiday season with The Little Market’s Peppermint Sugar Gift Box. This is box has their incredible sugar scrub, candle, and soaking salt, all in a yummy peppermint scent. Treat the beauty buff in your life while giving back to female artisans at the same time. This next gift is a beauty must. We’re low-key obsessed with everything that Kate Somerville has to offer, and this gift kit is the perfect way to introduce your loved ones to some of the best skincare. If the beauty guru in your life doesn’t already own this classic, we recommend stuffing her stocking with Lauren Conrad Beauty. Steal all of Lauren’s best beauty secrets all in one book. Have your beauty buff feeling beautiful from the inside out with this blend of Moon Dust sachets. Add them to your favorite beverage to help combat stress and have you feeling your best and most rejuvenated ever. Have you heard? Kristin Ess just came out with these ultra-chic gift boxes with the best her haircare line has to offer. This Working Texture Spray + Beach Wave Spray set even comes with a gorgeous French hair pin to complete the look. Last but not least, we have the BeautyBlender Gold Mine Kit for all of the makeup lovers out there. Blend that makeup look into perfection with the beauty world’s favorite tool. Do you have any gift ideas for the beauty buff in your life? Let us know your suggestions in the comments!